The Walkable Crown Hill Project was funded by a Small and Simple grant from the City of Seattle, Dept. of Neighborhoods. We held 2 public input sessions (charrettes) where Crown Hill neighobrs got together and provided input on some of the issues of walkability in our neighborhood. With no sidewalks, our neighborhood is at times treacherous to navigate on foot due to vehicular traffic and the inability to achieve an effective separation between pedestrians and vehicles. The study examines a number of potential solutions (a took kit) to creating a separated pedestrian walking surface or path. These solutions are considerably less expensive that the traditional street/gutter/curb/planter strip/sidewalk scenario, and thus could be more easily built. We also solicited public input and prioritization of a number of other street improvements. Seattle Department of Transportation reviewed the report and provided comments on all of the submitted solutions, and street improvements. A copy of the report can be picked up here. 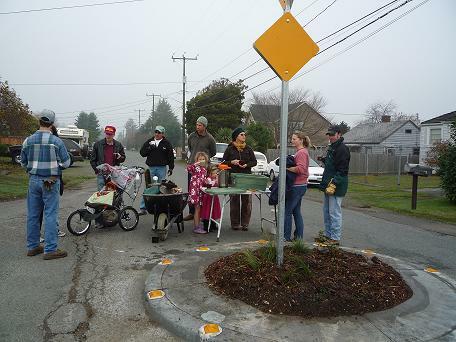 This morning as the fog was breaking up, a small band gathered at 12th and 95th NW, to plant the new traffic circle and take a first step to slowing the traffic on 12th Ave NW. In short order the mulch was pulled back, pots laid out, plants planted and watered, mulch put back, and the area swept clean. We planted drought tolerant, low maintenance plants provided by the city, as well as, a few donations from neighbors. Several folks have asked, and no, we did not plant a tree as the circle is too small to support a healthy tree. Celebrating a job well done with hot cider, we greeted neighbors passing by. Thank you to our enthusiastic planting crew, Joel, Nancy, Arik, Monica, Bert, Dennis, Kit, Heather, Tyler, Annika, Clara, and Tehama. Over 1.5 years ago, Crown Hill Neighborhood Association (CHNA) applied to the city Bridging the Gap fund for several projects. Both the circle and 12th and 13th on NW 95th were funded. The 13th Ave circle will be completed soon (the forms are in). Also neighbors on Mary worked to get the circle at Mary & 95th in earlier this year. CHNA and Sustainable Crown Hill are working together to make our Crown Hill Streets more walkable. Through the efforts of many we are are off to a great start. Thank you to everyone involved from the start. Once again, we had a fantastic second design charrette on July 12th and had even more folks show up to participate. Thanks for getting the word out and energizing our neighborhood base. We all did great work prioritizing areas of the neighborhood requiring attention and focus and honed in on some specific strategies in small groups. We are excited to share out the results of the charrette in the attached documents which include the narrative of the priorities exercise, the results of the priorities tally, the “long block” alternatives mockups, and the toolkit survey tabulation. Our Walkable Crown Hill coordinating committee is working with Makers Architects, which is supporting our planning process, to develop a draft of a plan based on the input from the two charrettes. We will be working with SDOT in particular in the coming weeks to clarify technical aspects of the plan and hope to have a draft ready to review with the community by late August. You can keep up with progress in the interim by checking out our website at walkablecrownhill.org. As always, please feel free to ask questions, offer your feedback in the meantime or to join us for our coordinating committee meetings by contacting Bert Hopkins by email (hierospace at gmail.com) or phone (388-2781). In particular, if you are interested in working with your neighbors on your block to implement any of the strategies being developed, let us know as we would like to support those blocks in getting ready to implement the solutions being developed in the plan. At the very least, tell your neighbors what we’re up to and send them to the website or have them contact us directly. Thanks for all of your interest and support and see you in the streets! Calling all Crown Hill neighbors to participate in our 2nd Annual CHNA Garage Sale. Over 50 households participated last year with loads of cool stuff! GREAT WAY TO MEET YOUR NEIGHBORS!! Add your address and a description of what you have for sale – it’s easy! When folks are ready to shop, they can print a map which lists the houses as well as a descriptions of sale items. Have the kids set up a lemonade stand and win prizes. First Design Charrette a Big Success! We’re happy to share a report from Walkable Crown Hill’s first design charrette on June 21st, working to create a pedestrian plan for Crown Hill. A big thanks to everyone who made it out, as we had a great turnout and fantastic energy in the room that day. As a result, excellent ideas and conversation were generated. The folks at Makers Architects, who are supporting us with our planning, have collated the results and generated a set of documents for us to use to prepare for the second design charrette. These include the notes from that meeting and maps based on each group’s input (Group 2, Group 3, Group 4), along with a combined map and a “next steps” document suggesting where we might focus from here. Even if you couldn’t make it to the first one, please plan to join us for the second charrette. We’ll be honing in on solutions and priorities and need everyone’s input and ideas. As always, talk to your neighbors about what we’re up to and bring them along. If you can’t make it, but would like to provide feedback, you can reply to this email or call Bert Hopkins (388-2781). If you haven’t had a chance to fill out our survey, you can still do so by clicking the survey button at walkablecrownhill.org. Feel free to forward this on to your neighbor networks or refer folks to our website. Have a fun and safe 4th weekend and see you all next week! How Walkable is our neighborhood? It has been said the first 1000 feet from your door determines the walkability of your neighborhood. The folks at Walkscore.com have developed an index called the “walkscore” which purports to analyze how walkable a particular address is. Though the index is clearly imperfect, it is an interesting exercise. By entering an address, you can calculate the walkscore for that address based on a number of factors. Check your walkscore here. If you’re a Crown Hill resident, leave a comment below identifying your approximate location and your score. In preparation for our pedestrian planning process we are surveying neighbors to find out about their walking habits, their concerns, and their ideas for improving the streets. We need your input, so please click here to take the survey. Walkable Crown Hill invites you to participate in our Neighborhood Pedestrian Planning Process. 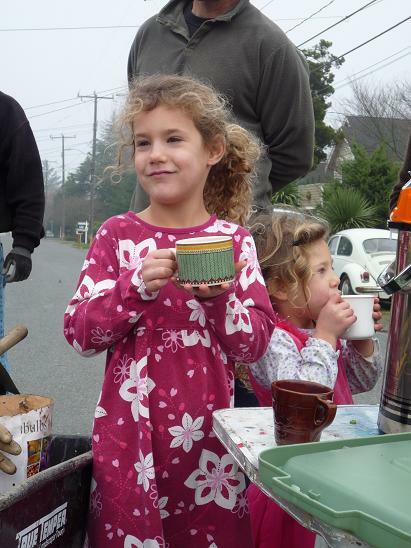 We need your help to develop a sustainable and creative vision for the future of our streets. What could a sustainable vision look like? We are looking at infrastructural changes, visual art, plantings, benches, kiosks and more. We want your input! June 21, Design Charrette No.1 Identify concerns, generate ideas, create solutions. 9:30 AM to Noon. Abundant Life Christian Fellowship 9204 11th Ave NW. Followed by a community lunch. July 12, Design Charrette No. 2 Refine ideas and move toward a plan. 9:30 AM to Noon. Abundant Life Christian Fellowship 9204 11th Ave NW. Followed by a community lunch. Our goals in this process are to calm traffic, enhance the beauty and character of the streets, and foster community by getting to know our neighbors. Pedestrian planning funded in part through a Small and Simple Grant from the Seattle Department of Neighborhoods. The Walkable Crown Hill web site is officially launched. The goal is to support our group’s effort to enhance the walkability of the Crown Hill Neighborhood in Northwest Seattle, Washington. Our group has recently received a Department of Neighborhoods grant to study and implement methods we can use to calm traffic on Crown Hill residential streets. Over the next several months, we will be conducting a neighborhood pedestrian planning process in which we hope to involve as many neighborhood residents as possible. We have an announcements mailing list to keep you informed on the latest developments. Visit here to join. We will be adding more information. Please bookmark this site and visit again soon.